Linda Briggs - Music Lover; Prom Queen! 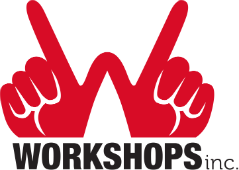 Linda started working at Workshops, Inc. in 1975. She loves working at Workshops, Inc., but it's probably her second love - her first is rock & roll! Kathy Dunn, our Director of Operations, grew up visiting her grandmother in Gate City, where Linda grew up. She remembers Linda getting on the bus with a boom box on her shoulder, blaring music for the whole neighborhood. Eventually (and thankfully), Linda graduated to a Walkman and now listens to her beloved music through an iPod. Linda lives in a group home and enjoys the activities and support they provide. This year, she even went to the Prom! The Tim Tebow Foundation sponsors proms across the country for people with disabilities, who otherwise wouldn't have the opportunity to go to the prom. Linda dressed to the nines and had a magical evening. At this prom, EVERYONE was crowned Prom King or Prom Queen, so Linda came home with a crown. ABC 33/40 did a piece on the prom - see if you can spot Linda! For 44 years Linda has been an important part of Workshops - completing handwork for local companies gives Linda a sense of pride and purpose as well as a paycheck. Linda works in both our Light Assembly and Industrial Assembly departments,and you can most often find her working on Birmingham Fastener's nut and bolt assembly. Come visit us at Workshops and you'll find Linda with a big smile on her face because no matter the task, Linda loves Workshops. And we love Linda! 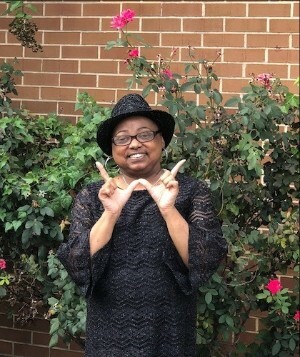 Providing work for Linda and her colleagues with the significant disabilities requires Workshops to seek donations to subsidize our workers' wages. Please click here to support Linda and her coworkers. Terrell Stewart with his mother Tracey. Sometimes the quiet ones get overlooked. Sometimes the ones that sit in the back and never cause problems don’t stand out and get noticed. But sometimes, those are the ones that surprise us all. 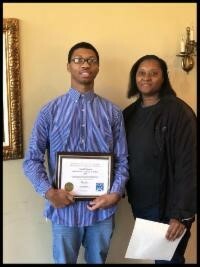 Terrell Stewart came to Workshops, Inc. fresh out of high school with a great work ethic, wanting to work and willing to do what it took to get a job. His biggest barrier was that he is quiet and shy, but he worked hard on his interviewing skills and pushed himself each day. When he went for his interview at Chick Fil A he convinced not only the manager that he would be a good employee, he also won over the owner of the store. They put Terrell in the back of the store breading chicken. He has now been working over a year. In that time, Terrell has been promoted and received raises for his good work. He was even named “Employee of the Month” on two separate occasions. The quiet, unassuming young man has found a home where he can go and make a difference. So, if you happen to be in Brookwood Mall and want a sandwich, Terrell will be the one who unpacked the truck, loaded the food into the freezer, and then quietly breaded the chicken. He won’t be the one at the front counter, but the quiet one in the back. Dorothy Webb, Workshops, Inc.’s bookkeeper, is our fashion role model. From beautifully matched dresses, shoes, and hats to silly celebrations like wearing a red white and blue headband with wiggling stars attached on the 4th of July, we always look forward to seeing what Dorothy is wearing! She is also a role model for Peter Watts, our security guard. On July 4th, 1988, Dorothy had a kidney transplant. She was in her early 20s, a college student, enjoying her life, when she discovered she had to first have dialysis, then a transplant. Thirty years later, she is healthy and energetic, and only has to see her kidney specialist once a year. Peter’s kidney transplant was more than 25 years later, so Dorothy is his go-to for advice about the ins-and-outs of being a transplant recipient. Dorothy came to Workshops on March 26, 1990 (did we mention she has an incredible memory? ), when she wanted to get into the workforce after recovering from her transplant. 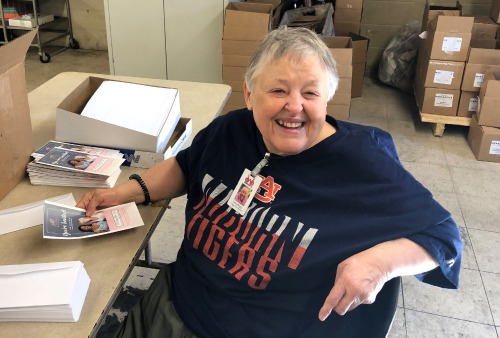 She started by making labels for our mailing department, then gradually moved up to assisting in the Executive Director’s office, then doing payroll, and finally after finishing her Accounting degree at UAB, she became Workshops’ bookkeeper. She also met the love of her life at Workshops. A month after she started, Workshops hired David Webb to be our security guard. He immediately took to Dorothy. She took some convincing… almost 20 years of convincing! He would buy her gifts, hang around her desk, and do anything he could to get her to go out with him. Finally, in 2005 she agreed to a date. It took another four years for them to marry, and their married life was full of fun and adventure. They loved to travel, including going to New York and to the Grand Canyon. They had a great life! Sadly, just two years after they married, in 2011, David died of cancer. Dorothy is not one to dwell on the past or sadness. Instead, she enjoys her friends, her job, and living with her nephew, Tony, who is 34 and uses a wheelchair full-time due to cerebral palsy. She loves watching monster movies, like Sharknado, Jurassic Park, the Halloween series and Friday the 13th. And she loves burgers. Dorothy REALLY loves burgers. And we REALLY love Dorothy.